We have hit the point where oil, and fossil fuels in general, are coming up on headwinds too strong to fight forever. If shale continues to drive oil prices down with peddle to the metal drilling, we can expect Saudi Arabia to flood the market with oil, bankrupting shale again. The short to intermediate term still favors oil approaching $80 per barrel as Saudi Arabia curbs production and shale slows growth plans - we'll see if that holds. I plan to be very active in oil stock options, both owning calls and puts, for a very long time. However, Occidental is the only company I am likely to own outright long-term. Oil has been extremely volatile due to the markets becoming thinly traded as I predicted would happen last July. The underlying money flows fully explain the stock and commodity volatility in the fourth quarter of 2019. While I have forecast a balance between supply and demand for oil in the intermediate term that would lead to a range bound price near $80 per barrel, sudden events have not allowed that scenario. In any short-term, the ebbs and flows have been more like crashes and tidal waves. I don't expect this volatility to stop anytime soon. For those who want to invest in oil for the long-term, it is time for a new plan. Oil and oil stocks, while always trading vehicles to an extent, are more so now than ever before. Those who want to make money in oil stocks had better learn to be cyclical swing trades who embrace both long and short positions. In early 2014, the price of oil was over $100/barrel. There were fears that higher oil prices would stunt economic growth. There was also a mini-mania for oil stocks. "...The result will likely be a range-bound price of petroleum that can be impacted in any short-term window by the usual international event concerns and economic growth cycles. This range will be from around $80 per barrel to around $120 per barrel — we were recently at about $103 on the July West Texas Crude (WTI) contract — as companies and countries alike need to maintain a balanced pricing structure. That's not to say there can't be out of the ordinary price plunges or spikes, however, should those occur, that opens the door for unique leverage opportunities by enterprising investors..."
"I believe there is a high probability that we do move to the low end of the oil-price range later this year, thus I have sold my profits in both Whiting and Triangle..."
Of course, within 18 months we saw oil instead drop out of the natural price range for oil in one of those "out of the ordinary price plunges." And, since then, due to technology improvements and massive refinancing by the shale industry, we have also seen the range for oil drop by about $20 per barrel. Recently, we saw another "out of the ordinary" drop in the price of oil to $44/barrel range on WTI (a bit higher for Brent). That has led many to ask: will oil prices ever rise again? The simple answer is yes, but it is much more complex than that. In June of 2015, I proclaimed on MarketWatch that we were at "the beginning of the end for the oil age." I was lambasted in commentary, generally criticized in the financial press and literally got hate email. That experience led to me to believe that there was massive denial about the future of energy. This denial is led by backwards looking investors and steeped in ideology. In the past several years, despite a very resilient economic expansion, the demand growth for oil has been slowing. Today, it is nearly stagnant, expected to grow only about 1% to 1.8% this year depending on if you prefer the IEA, EIA, any number of analysts, companies, industry groups or think tanks. 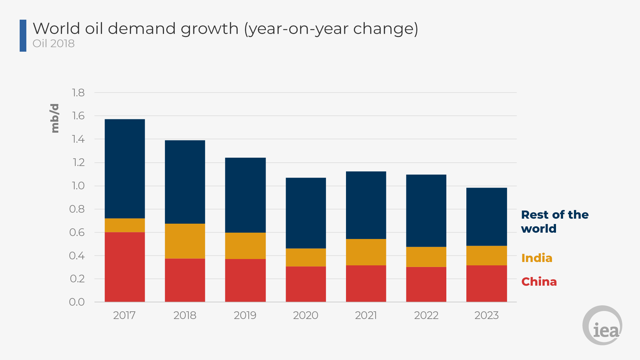 Here are IEA oil demand growth projections from 2017 and 2018. You can see that the IEA projection was a bit low for 2017 initially, but has turned out to be about spot on for 2018 (we'll know how close in a few weeks). The trend for oil demand is in no doubt. 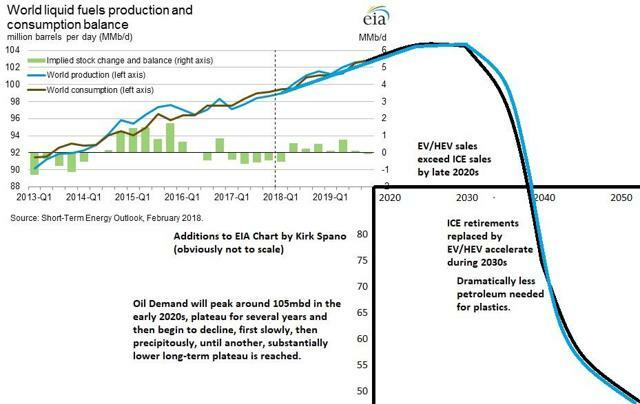 Demand growth for oil now falling, that means only one sure thing about the future - demand destruction for oil is coming soon. How soon is an important question for investors and traders. For those who insist that oil stocks are a good long-term investment, they must believe that oil demand growth will stretch out for a long time and that demand destruction won't happen before 2040 or 2050. Why must long-term investors have that assumption? Simply because the markets will adjust far sooner than demand destruction actually occurs. Recently, BP (BP) and Royal Dutch Shell (RDS.A) both posited that oil demand will start to shrink by about 2030. Whether demand falls off that dramatically in the 2030s or not, the rational observation is that demand will no longer be growing by then. 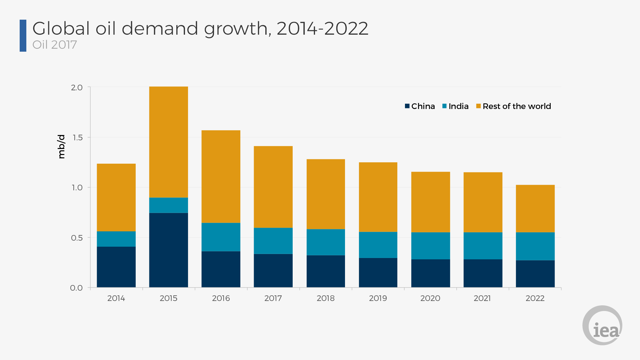 To some extent, demand for oil will fall in the 2030s. This all means that we have moved on another inning in the end game for the oil age. I have recently suggested putting money into oil stocks again in Here's Why Oil Is Headed To $80. That does not mean I think oil will not be volatile. It will be. Goldman Sachs (GS) just said that oil will rise through midyear and then fall again at year-end. I do not expect oil to crash as it did in 2018 though. Last year there was a perfect storm of money flowing out of markets in the fourth quarter as tax-loss selling and hedge fund liquidations piled onto permanent pension distributions, the Fed QT program cut $50 billion per month from the economic system and a dramatic drop in foreign investment occurred. It is not likely we do see that combination again this year, but it will happen again eventually. What does this mean for those looking to invest? Well, there is another long-term headwind besides peaking and falling oil demand. Barron's of course makes The Case Against Divesting From Oil Stocks. Their main point is that a lot of companies will remain very profitable for a long time. That's a pretty strong argument for investors. What I see is a tug of war that is just getting started and creating a heckuva trading environment. For the near term, the SPDR Oil and Gas E&P ETF (XOP) is worth a look. It is over 25% below its 2018 high, but has just started to move up. It doesn't own much Exxon or Chevron and is focused on shale stocks. It's worth buying on pullbacks - like now. The best oil stocks are those with good rock and clean balance sheets that are starting to churn out cash to shareholders. These are companies that will survive the volatility. They also make for great options trading around a core position. The vast majority of oil stocks that will survive and trade higher are Permian based. They'll have an upward bias in coming years as many companies focused on other basins struggle. That is why companies like Pioneer Resources (PXD) and Devon Energy (DVN) have both moved to be Permian pure plays. Both are buys right now in my estimation. On Thursday, I will publish my "Dirty Dozen Oil Stocks For 2019." If you don't already follow me, I urge you to click on my profile and follow me now. Disclosure: I am/we are long XOP, DVN, OXY. I wrote this article myself, and it expresses my own opinions. I am not receiving compensation for it (other than from Seeking Alpha). I have no business relationship with any company whose stock is mentioned in this article. Additional disclosure: I own a Registered Investment Advisor - https://bluemoundam.com - however, publish separately from that entity for self-directed investors. Any information, opinions, research or thoughts presented are not specific advice as I do not have full knowledge of your circumstances. All investors ought to take special care to consider risk, as all investments carry the potential for loss. Consulting an investment advisor might be in your best interest before proceeding on any trade or investment.